All pathogenic Leishmania species reside and replicate inside macrophages of their vertebrate hosts. Here, we present a protocol to infect murine bone marrow-derived macrophages in culture with Leishmania, followed by precise quantification of intracellular growth kinetics. This method is useful for studying individual factors influencing host-pathogen interaction and Leishmania virulence. Sarkar, A., Khan, Y. A., Laranjeira-Silva, M. F., Andrews, N. W., Mittra, B. Quantification of Intracellular Growth Inside Macrophages is a Fast and Reliable Method for Assessing the Virulence of Leishmania Parasites. J. Vis. Exp. (133), e57486, doi:10.3791/57486 (2018). The lifecycle of Leishmania, the causative agent of leishmaniasis, alternates between promastigote and amastigote stages inside the insect and vertebrate hosts, respectively. While pathogenic symptoms of leishmaniasis can vary widely, from benign cutaneous lesions to highly fatal visceral disease forms depending on the infective species, all Leishmania species reside inside host macrophages during the vertebrate stage of their lifecycle. Leishmania infectivity is therefore directly related to its ability to invade, survive and replicate within parasitophorous vacuoles (PVs) inside macrophages. Thus, assessing the parasite's ability to replicate intracellularly serves as a dependable method for determining virulence. Studying leishmaniasis development using animal models is time-consuming, tedious and often difficult, particularly with the pathogenically important visceral forms. We describe here a methodology to follow the intracellular development of Leishmania in bone marrow-derived macrophages (BMMs). Intracellular parasite numbers are determined at 24 h intervals for 72 - 96 h following infection. This method allows for a reliable determination of the effects of various genetic factors on Leishmania virulence. As an example, we show how a single allele deletion of the Leishmania Mitochondrial Iron Transporter gene (LMIT1) impairs the ability of the Leishmania amazonensis mutant strain LMIT1/ΔLmit1 to grow inside BMMs, reflecting a drastic reduction in virulence compared to wild-type. This assay also allows precise control of experimental conditions, which can be individually manipulated to analyze the influence of various factors (nutrients, reactive oxygen species, etc.) on the host-pathogen interaction. Therefore, the appropriate execution and quantification of BMM infection studies provide a non-invasive, rapid, economical, safe and reliable alternative to conventional animal model studies. Leishmaniasis refers to a broad spectrum of human diseases caused by protozoan parasite species of the genus Leishmania. Approximately 12 million people are currently infected with Leishmania worldwide, and more than 350 million are at risk. The disease pathology depends on the Leishmania species and on host factors, and symptoms vary from innocuous self-healing skin lesions to lethal visceralizing forms. If untreated, visceral leishmaniasis is fatal, ranking only after malaria as the deadliest human disease caused by infection with a protozoan parasite1. In spite of the wide-ranging differences in disease pathology and symptoms, all Leishmania species have a digenic life-cycle alternating between promastigote and amastigote stages inside insect and vertebrate hosts, respectively. Inside vertebrates, Leishmania target host macrophages for invasion and induce the formation of parasitophorous vacuoles (PVs), acidic compartments with properties of phagolysosomes where the highly virulent amastigote forms replicate. Amastigotes persist in host tissues during chronic infections and can be passed forward to uninfected sandflies, completing the transmission cycle. Therefore, in the context of human disease development, amastigotes are the most important Leishmania lifecycle form2. Investigating how amastigotes replicate inside macrophage PVs is critical for understanding Leishmania virulence3,4,5,6,7 and for the development of novel efficacious therapies. We describe here a method regularly used by our laboratory to study Leishmania infection and replication in bone marrow-derived macrophages (BMMs), which involves quantitative assessment of the number of intracellular Leishmania over time. The process involves harvesting of monocytes from mouse bone marrow and differentiation to macrophages in culture, in vitro infection with infective forms (metacyclic promastigotes or amastigotes) of Leishmania and quantification of the number of intracellular parasites at every 24 h interval for a period of 72 - 96 h following infection. This assay has been used in our laboratory to determine the impact of several environmental factors and parasite genes, including identification of the critical role of iron in promoting L. amazonensis virulence that was further validated by footpad lesion development studies in mice6,8,9,10,11,12,13,14,15. Since all pathogenic Leishmania species establish their replicative niche inside host macrophages, this assay can be used universally for virulence determinations in all Leishmania species. Performing BMM infections allows analysis of host-parasite interactions at the single cell level, and thus a more extensive understanding of how Leishmania parasites interact with their preferred host microenvironment, the PVs of macrophages. Macrophage infection assays have been successfully used by multiple groups16,17,18,19,20,21,22 to explore functions of both the host macrophage and Leishmania specific genes, and their potential involvement in the complex interplay that characterizes intracellular infection. BMM infections allow quantification of parasite growth as a read-out of the impact of host factors that influence intracellular survival, such as microbicidal nitric oxide production, generation of reactive oxygen species and other adverse conditions encountered inside the lysosome-like PVs23. Macrophage infection assays have also been utilized to identify potential anti-leishmanial drug leads for therapeutic development13,24. The in vitro nature of BMM infections provides several advantages over other methods to assess Leishmania virulence. However, several previous studies examining mechanisms of intracellular parasite survival over time did not quantify infection as a rate20,21,24. Furthermore, many studies focused on following in vivo infections over time did so by measuring cutaneous lesion size and other physiological symptoms that are only indirectly related to parasite replication25,26,27. In vivo infection is a stringent approach to assess parasite virulence, but lesion size measurements based on footpad swelling alone are often inadequate, as they reflect the inflammatory response in infected tissues and not the absolute number of parasites. For this reason, footpad lesion development assays have to be followed by quantification of the parasite load in infected tissues, a procedure that requires lengthy limiting dilution assays28. Additionally, in vivo studies often involve sacrificing multiple animals at different points in time to extract tissues of interest6,8,9,10,11,13. In contrast, large numbers of BMMs can be obtained from just one animal, and these cells can be plated under conditions that allow assessment of infection at various points in time. Furthermore, compared to in vivo studies, performing in vitro BMM infections allows greater control over experimental conditions. Quantifying the macrophages to be infected along with the parasites themselves allows precise control of the multiplicity of infection (MOI) and of culture conditions. Fine control over these factors can be key in identifying characteristics of discrete cellular pathways and in understanding their impact on the course of infection. Given these advantages, it is somewhat surprising that very few groups studying Leishmania virulence have so far taken full advantage of quantitative assessment of intracellular replication in macrophages. In this article, we discuss common pitfalls that may be hampering the more extensive utilization of this assay, and provide a step-by-step protocol to facilitate its proper implementation. Considering its precision and versatility, the BMM infection assay we describe here can not only be utilized to explore host-pathogen interactions influencing Leishmania virulence, but also to study other microorganisms that replicate inside macrophages29. Importantly, this assay can also be developed as a rapid and economical pre-clinical screening method for anti-leishmanial drug development. All experimental procedures were conducted in accordance with the recommendations in the Guide for the Care and Use of Laboratory Animals by the National Institutes of Health and were approved by University of Maryland's IACUC. All steps described in sections 1 through 4 should be carried out aseptically inside biological laminar flow cabinets. Personal protection should be used, and caution should be exercised during handling of live Leishmania parasites throughout all stages of experimentation. Day 0: Sacrifice 4 - 6-week-old female C57BL/6 or BALB/c mouse in a CO2 chamber and confirm death via cervical dislocation. Ensure sterilization of scissors and forceps by keeping them soaked in 70% ethanol. Spray gloves with 70% ethanol to allow sterile handling throughout the bone marrow cell isolation process. Secure sacrificed mouse to dissection board by pinning its forelimbs and disinfect by spraying copiously with 70% ethanol. Make a small incision (about 1 cm) with scissors near the hip joint. Carefully insert scissors under the skin to separate the underlying muscle and cut the skin all the way around the hip joint. NOTE: The dissection board may be rotated to allow improved access to the hip joint. Carefully deglove skin from the leg by pulling towards the ankle and remove. Cut the foot off at the ankle, being very careful to cut at or below the ankle joint to leave the tibia fully intact. NOTE: The fibula at this stage is loosely attached and can be easily separated with the forceps. Manually locate the hip joint by manipulating the femur to identify the point of rotation. Carefully use scissors to sever the leg above the hip joint to leave the proximal head of the femur intact. Remove as much muscle and connective tissue as possible from the leg with scissors. Remove any remaining skin from the ankle and any excess bone material above the hip joint. Place the cleaned leg bones in sterile RPMI supplemented with penicillin/streptomycin (1% final concentration) in a Petri dish on ice. Repeat steps 1.4 through 1.6 to isolate tibia and femur from the other hind leg. Remove any remaining muscle and connective tissue from the bones soaking in RPMI using sterilized forceps and sterile #10 blade. Place bones on the Petri dish lid. Cut the tibia carefully with the blade immediately above the ankle joint to access the marrow. Remove the tibia from the rest of the leg by cutting immediately below the knee joint. Draw 10 mL sterile RPMI supplemented with penicillin/streptomycin (1% final concentration) into a 10-mL syringe and attach a 25G needle. Hold the tibia firmly with forceps, vertically over a 50-mL conical tube on ice. Use the syringe to gently inject approximately 5 mL RPMI into the end of the bone to flush the bone marrow out of the other end into the conical tube. Flush the bone marrow with a total of 10 mL RPMI until the bone turns white. NOTE: After thorough flushing, the bone should turn white. If not, continue flushing to remove marrow. The distal end of the tibia may need to be trimmed back with the blade if it is too narrow to insert the needle. Cut the femur immediately above the knee joint and immediately below the hip joint to expose both ends of the bone to access the marrow. Flush bone marrow from the femur with a total of 10 mL RPMI in the same fashion as the tibia. NOTE: If a bone breaks at any point during dissection prior to bone flushing, do not use the marrow from this bone. Centrifuge the conical tube used to collect bone marrow flushed from all four bones for 10 min at 4 °C at 300 x g.
Place 60 mL of sterile BMM medium (RPMI with a final concentration of 20% FBS, 1% penicillin/streptomycin, 1.2 mM Na-pyruvate, 25 µg/mL human M-CSF) into a 175 cm2 cell culture flask with filter cap. Discard the supernatant following centrifugation and resuspend the cell pellet by gentle up and down pipetting using 5 mL of BMM medium from the flask. Transfer cell suspension to the culture flask and rinse the conical tube twice with BMM medium from the culture flask to ensure maximal cell recovery. Ensure cell suspension is thoroughly mixed into medium and distribute 30 mL from the initial 175 cm2 cell culture flask to a second 175 cm2 cell culture flask with filter cap. Incubate both flasks containing 30 mL cell suspension each overnight at 37 °C, 5% CO2 to allow separation of any contaminating fibroblasts, resident macrophages, and other adherent cells. DAY 1: Transfer the supernatant containing undifferentiated bone marrow cells from flasks to 100 mm x 15 mm non-TC-treated polystyrene Petri dishes at approximately 10 mL/dish and incubate at 37 °C, 5% CO2. Discard the flasks. DAY 3 or 4: Add an additional 5 mL BMM medium (pre-warmed to 37 °C) to each Petri dish and continue incubation at 37 °C, 5% CO2. Prepare 6-well tissue culture plates by placing four (4) sterile 12 mm glass coverslips (autoclaved and stored in a closed glass container) in the bottom of each empty well. NOTE: Pick each sterile 12 mm coverslip up with an aspirating tip fitted to a vacuum line. Place coverslips into the wells without overlap, releasing at the desired position by pinching the tube to interrupt vacuum. Aspirate media (and any non-adherent cells) from Petri dishes coated with adherent bone marrow derived macrophages and gently rinse adherent cells 2x with sterile Dulbecco's Phosphate buffered saline without calcium and magnesium chloride (PBS -/-) pre-warmed to 37 °C. Add dropwise, 5 mL sterile 1x PBS -/- with a final concentration of 1 mM EDTA to each Petri dish and incubate for 5 min at 37 °C to detach adherent BMMs. Verify that the cells are detached using a microscope. Collect all detached cells suspended in 1x PBS -/- supplemented with 1 mM EDTA in a 50 mL conical tube. Rinse each dish 2x with 5 mL PBS -/- and add to cell suspension pool. NOTE: Cell suspension may be diluted with additional PBS -/- to protect macrophages from EDTA toxicity during the collection process. Centrifuge at 300 x g for 10 min at 4 °C. Discard supernatant and resuspend macrophages in 5 - 10 mL BMM medium by pipetting. Place resuspended cells on ice to prevent attachment to tubes and clumping. Count viable cells using Trypan blue exclusion in the hemocytometer. NOTE: To count BMM cells resuspended in 5 mL medium, a dilution-mix of 25 µL cell suspension in 445 µL PBS -/- and 30 µL 0.4% Trypan blue solution typically allows easy quantification in a hemocytometer (taking into account a 20x dilution factor for the final calculation). Count only cells that did not get stained with Trypan blue (viable cells). The volume of cell suspension may be altered if this mixture is too concentrated or diluted. In general, the yield of BMM per preparation varies between 2 x 107 and 5 x 107 cells from a single mouse. Prepare the cell suspension in BMM medium at desired plating concentration (5 x 105/mL) and disperse suspension to 6 well plates in 2 mL medium per well so that each well receives 1 x 106 macrophages. NOTE: This is a critical step that ensures every well gets the adequate number of macrophages to cover the coverslips uniformly. Check that coverslips in wells are not overlapping or floating in the medium. If so, gently adjust with a sterile pipette tip. Incubate overnight at 37 °C, 5% CO2. NOTE: Prepare Leishmania for infections- purify metacyclic promastigotes from stationary promastigote cultures8,13, or differentiate promastigotes in culture into amastigote form using standard L. amazonensis axenic differentiation protocol6,8. Prepare 40% stock solution of density gradient media in sterile, endotoxin-free water. Dilute density gradient solution in 10x M199 medium (without serum) to prepare 10% concentration in the M199 medium. Filter all solutions through 0.22 µm filter. NOTE: Stock solutions can be stored at 4 oC in darkness for no longer than 1 month. Add 2 mL of 40% density gradient media solution in the bottom of a 15-mL conical centrifuge tube. Layer 2 mL of 10% density gradient media solution in M199 on top of the 40% density gradient media layer carefully, using a Pasteur pipette to avoid any mixing between the two layers. 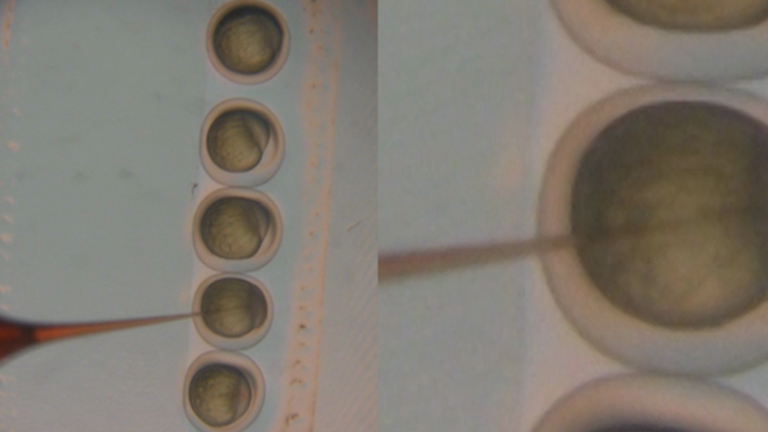 Collect 1 x 109 parasites from stationary-phase culture by centrifugation at 1,900 x g for 10 min. Resuspend cells in 6 mL Dulbecco's Modified Essential Medium (DMEM). Layer 2 mL of the cell suspension directly on top of the 10% density gradient media layer, gently, using a Pasteur pipette to avoid mixing between layers. Centrifuge the gradient for 10 min at 1,300 x g at room temperature. NOTE: Due to differences in physical properties between Leishmania species, centrifugation conditions for each might have to be slightly adjusted to ensure maximum yield. Collect parasites (enriched in metacyclic promastigote form) from the band formed at the upper 10% density gradient media boundary (interface between the 0% and 10% density gradient media layers). Dilute parasites with one volume of DMEM and collect by centrifugation (1,900 x g for 10 min at room temperature). Resuspend in 500 µL DMEM medium and count in a hemocytometer to quantify yield. Mix 5 mL of log-phase promastigote culture (pH 7.4 at 26 oC) with an equal volume of amastigote medium (pH 4.5), using 25 cm2 flasks (total 10 mL medium) and incubate at 26 °C overnight. Shift the flask from 26 °C to 32 °C. After 3 or 4 days, split culture 1:5 in amastigote media at 32 °C. Check the parasites in the next 3 - 4 days (maximum 7 days) to see if they are ready for use in infections. NOTE: Healthy axenic amastigotes should have an oval shape, without visible flagella. Partially differentiated amastigotes have a large oval shape with short flagella. The culture should not have a lot of clumps - many clumps are an indication of non-growing, dying parasites. The amastigote culture can be split 1:5 and maintained for a maximum of 3 weeks. Dilute parasite suspensions according to desired MOI (usually 3-5 metacyclic promastigotes per macrophage [MOI of 1:3 or 1:5] and 1 amastigote per macrophage [MOI 1:1]). Add Leishmania in PBS -/- in a volume of 50 - 100 µL to each well already containing 2 mL medium. Incubate BMMs for 1 h with amastigotes and 3 h with metacyclic promastigotes at 34 oC for infection. NOTE: Optimal infection temperature may vary by species. Following incubation, thoroughly wash away free parasites in each well 3x with 2 mL PBS -/- pre-warmed to 37 °C. NOTE: Disperse PBS gently to ensure that coverslips do not float over each other. Gently swirl the plate and then aspirate out the liquid. Use separate aspirating tip if using multiple strains of parasites to avoid cross-contamination. Fix 1 h or 3 h time-point samples by incubating each well with 1.5 - 2 mL of 2% PFA in PBS -/- for 10 min. Wash 3x with PBS -/-. Do not aspirate last wash and refrigerate plates containing coverslips in PBS until staining. Add 2 mL fresh BMM medium to each well on plates for further time-points and incubate at 34 °C. Fix remaining time-points as desired as described in step 4.3, and refrigerate plates until staining. Aspirate PBS from wells containing coverslips and add 1.5 mL PBS -/- with 0.1% non-ionic detergent. Incubate for 10 min at room temperature, followed by 3x wash with 2 mL PBS -/-. Add 1 mL PBS -/- with 2 µg/mL DAPI (diluted from 5 mg/mL stock solution in water) to wells containing coverslips and incubate for another 1 h at room temperature. NOTE: The incubation time with DAPI is critical for proper visualization of intracellular Leishmania parasites. Macrophage nuclei stain rapidly, due to their larger size and DNA content but staining of nuclei of the intracellular parasites is slower. Thus, extending incubation time beyond what is required to visualize the BMM nuclei is necessary to allow DAPI to permeate through and the parasite plasma membrane, and the parasite nuclear membrane. With proper DAPI stain, the mitochondrial kinetoplast DNA near the flagellar pocket of the parasite can also be visualized, in addition to the nuclear DNA. Wash each well containing coverslips 3x with 2 mL PBS -/- and then lift and flip coverslips with forceps to place the cell side down and mount on glass microscope slides with a commercially available antifade mounting reagent. NOTE: Coverslips are extremely fragile and need cautious handling. Avoid putting pressure on them, especially against the sidewall of the wells when lifting. Adding a few drops of PBS -/- reduces surface tension between the coverslip and well and facilitates the lifting process. A fine gauge needle may be used to assist in prying the coverslips from the bottom of the well. After placing a coverslip on the slide, gently press down with forceps to push out any air bubbles in the mounting media. If a coverslip is broken or has possibly flipped during the lifting process, do not remount; simply use the spare fourth coverslip. Examine DAPI-stained slides under a fluorescence microscope by focusing on macrophages using 100X objective lens with immersion oil (excitation at 358 nm; optimal emission at 461 nm). Ensure that focus is on the layer of macrophages between the glass slide and coverslip. Quantify the number of macrophages (large nuclei stained with DAPI) and the number of smaller amastigote nuclei clustered around each macrophage nucleus (see Figure 2A, DAPI) for each field of vision, using a manual counter. NOTE: Amastigote nuclei may not all be visible in one plane of focus due to their small size. Count those that are visible when focused on macrophage nuclei, and then use fine focus to check for parasite nuclei in planes above and below the macrophage nuclei. Move to another field of vision to repeat quantification. Use a separate counter key to track the number of fields counted. Move through visual fields in parallel rows across each coverslip, to prevent counting overlap. Quantify a minimum of 200 macrophages per coverslip. Quantify each time-point of infection in triplicate (3 coverslips). Count the fourth coverslip if one of the previous is not suitable for counting due to coverslip overlap, poor mounting, glass breakage, etc. NOTE: If 200 macrophages cannot be counted on any one coverslip, count the spare fourth. Calculate infection rates as amastigotes/macrophage or amastigotes/100 macrophages and determine percent infected macrophages from the raw quantification data. Leishmania has two infective forms - metacyclic promastigotes that differentiate from procyclic promastigotes at the stationary phase of culture, and amastigotes, which are the intracellular stages (Figure 1). In some Leishmania species such as L. amazonensis, amastigotes can also be differentiated in axenic culture by shifting the promastigote cells to lower pH (4.5) and elevated temperature (32 °C), conditions similar to those found inside BMM PVs8,34. Only metacyclic promastigote or amastigote forms of Leishmania are able to induce the formation of PVs and replicate intracellularly after being engulfed by host macrophages35. Undifferentiated log-phase promastigotes are non-virulent and unable to promote PV formation (Figure 2). In the case of infections with metacyclic promastigotes, there is usually a 24 h delay before an increase in intracellular parasite numbers. This occurs because the metacyclic promastigotes have first to differentiate into amastigotes before they start replicating. For this reason, infections initiated with metacyclic promastigotes will take longer to show increases in total intracellular parasite numbers, and for this reason, may have to be incubated for longer time points. Figure 2A represents a successful infection using axenically differentiated amastigotes, showing intracellular localization of Leishmania (in red) after initial infection (1 h), prior to the formation of PVs by fusion of phagosomes with lysosomes. At 48 h, distinct large PVs harboring multiple parasites can be observed. A steady increase in the number of parasites inside PVs is characteristic of virulent Leishmania infections. Non-virulent log-phase promastigotes (Figure 2B), in contrast, are unable to initiate PV development (48 h time point), fail to replicate and are eventually killed inside host macrophages, even when taken up by the host macrophages at comparable numbers to metacyclic promastigotes or amastigotes. To demonstrate the efficacy of this method, we compared wild-type L. amazonensis with LMIT1/ΔLmit1 parasites containing a single copy of the LMIT1 (Leishmania Mitochondrial Iron Transporter 1) gene, which results in impairment of mitochondrial iron import13. Loss of one LMIT1 allele did not result in significant alterations of mitochondrial activity in LMIT1/ΔLmit1 promastigotes or reduce the yield of purified metacyclic forms when compared to wild-type promastigotes13. Purified metacyclic promastigotes from both wild-type (WT) and LMIT1/ΔLmit1 stationary cultures were equally effective in invading BMMs, based on the comparable number of intracellular parasites quantified 1 h after infection (Figure 3A, 1 h). Following an initial 24 h time lag, that is required for metacyclic promastigotes to adapt and differentiate into amastigote forms, a steady increase in the number of intracellular wild-type parasites (approximately 3-fold between 24 h and 72 h time points) was observed. In contrast, little or no intracellular growth of LMIT1/ΔLmit1 parasites (compare 1 h and 72 h time-points) was observed, suggesting that loss of single LMIT1 allele significantly affects the ability of this strain to grow inside macrophages. 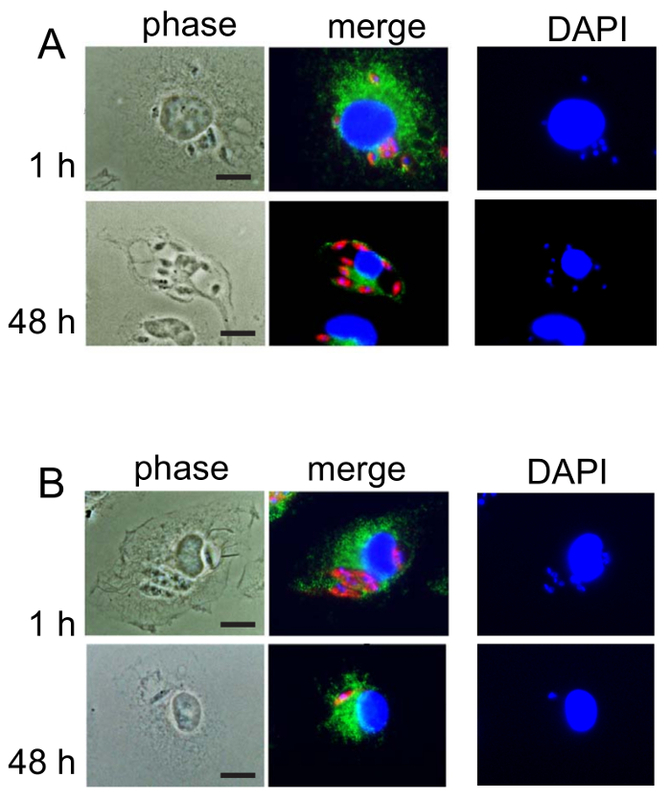 Episomal expression of the LMIT1 protein in the complemented strain (LMIT1/ΔLmit1+LMIT1) rescued intracellular parasite growth to wild-type levels, confirming that LMIT1 is critical for amastigote intracellular replication and virulence13. Macrophage infections carried out with axenic amastigotes, generated by shifting promastigote cultures (at pH 7.4; 26 oC) to amastigotes growth conditions (pH 4.5; 32 oC)34,36, showed an intracellular growth pattern (Figure 3B) similar to that observed with metacyclic promastigotes (Figure 3A). 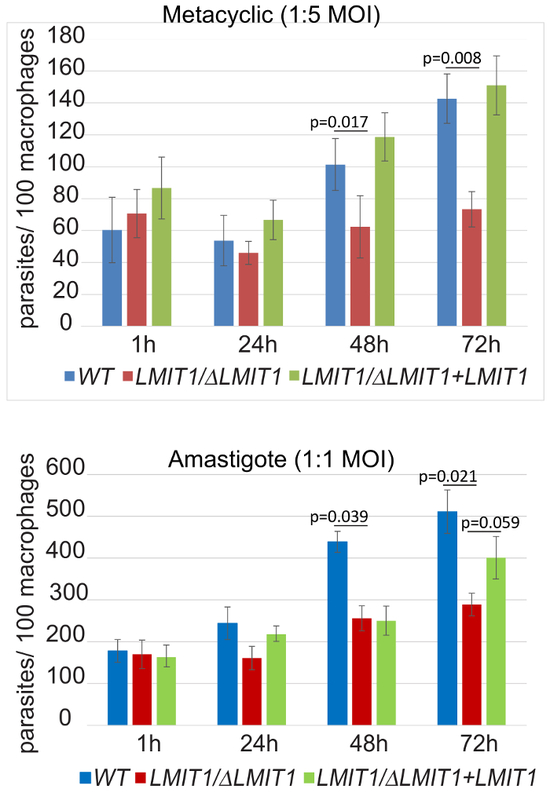 Following comparable levels of initial uptake (Figure 3B, 1 h) wild-type (WT) and LMIT1 complemented (LMIT1/ΔLmit1+LMIT1) amastigotes grew steadily, while LMIT1/ΔLmit1 amastigotes again failed to show intracellular growth. Axenic amastigotes were more infective (MOI 1:1 compared to 1:5 for metacyclic promastigotes) and replicated more efficiently inside PVs. Our data demonstrate an initial 24 h delay for metacyclic promastigote infections, before there is an increase in intracellular parasite number (compare between 24 h time points in Figure 3A and 3B). The lag represents the time required for internalized metacyclic promastigotes to first differentiate into amastigotes before starting to replicate. One common mistake people make when using metacyclic promastigotes to infect, is not wait long enough. In cases where the change in virulence is not drastic, experiments conducted over 96 h rather than 72 h produce much more reliable determinations. Figure 1: Scanning Electron Micrograph images of various L. amazonensis life-stages. Log-phase promastigote, metacyclic promastigote from stationary-phase and axenic amastigote. Bar = 10 µm. Please click here to view a larger version of this figure. Figure 2: A representative illustration of BMM infection with virulent axenic amastigotes (A) and non-virulent log-phase promastigotes (B) of L. amazonensis. Immunofluorescence images of macrophages isolated from BALB/c mice, 1 h and 48 h following infection. Infected macrophages were processed for immunofluorescence as described in the protocol. PV membranes were stained with rat anti-mouse Lamp1 monoclonal antibody (1:1,000 dilution) for 1 h, followed by 1 h incubation with anti-rabbit fluorescent IgG (1:500 dilution). Parasite staining was performed by incubating coverslips with mouse polyclonal antibodies generated against axenic L. amazonensis amastigotes, followed by anti-mouse IgG red dye (1:500 dilution) 6. All coverslips were further treated with DAPI for staining nuclei. (A) Formation of distinct PVs harboring multiple amastigotes at 48 h time point is characteristic of a successful Leishmania infection with axenic amastigotes. (B) Absence of distinct PV formation and replicating amastigotes at 48 h time point typifies lack of virulence in promastigotes from log-phase culture. Red indicates anti-Leishmania staining, green indicates anti-Lamp1, blue indicates DAPI-stained DNA and yellow indicates merge of anti-Lamp1 and DAPI stains. Bars, 5µm. This figure has been modified from Mittra, B. et al., 2013. Originally published in J. Exp. Med. Please click here to view a larger version of this figure. Figure 3: Deletion of one LMIT1 allele severely impairs the intracellular growth of mutant LMIT1/Δlmit1 parasites. BMM were infected for the indicated times with L.amazonensis and either fixed immediately or further incubated for 24, 48 or 72 h before they were fixed, stained with DAPI, and the number of intracellular parasites was determined microscopically. (A) BMMs were infected with purified wild-type (WT), single knockout (LMIT1/Δlmit1) and complemented single knockout (LMIT1/Δlmit1+LMIT1) metacyclic promastigotes (MOI 1:5) for 3 h and fixed immediately or incubated further for the indicated time points, and the number of intracellular parasites was determined microscopically. The data represent the mean ± SD of triplicate determinations and are representative of the results of three independent experiments. The asterisks indicate significant differences in infectivity between WT and LMIT1/Δlmit1 parasites (Student's two-tailed t-test 48 h, p = 0.017; 72 h, p =0.008). (B) Axenic amastigotes from wild-type (WT), single knockout (LMIT1/Δlmit1) and complemented single knockout (LMIT1/Δlmit1+LMIT1) cultures were tested for their ability to infect BMMs. BMMs were infected for 1 h (MOI 1:1) and either fixed immediately (1 h) or after further incubation for 24, 48 or 72 h, and the number of intracellular parasites was determined microscopically. The data represent the mean ± SD of triplicate determinations and are representative of more than three independent experiments. P-values (Student's two-tailed t-test) between respective groups are indicated. This figure has been modified from Mittra, B. et al., 2016. Originally published in PloS Pathog. Please click here to view a larger version of this figure. The quantitative data produced by the BMM infection assay described above, allows investigators to obtain rates of infection and a reliable determination of changes in virulence properties in a relatively shorter time period (maximum 2 weeks, compared to the 2 months required for in vivo experiments). This method relies on the DNA specific dye DAPI, which specifically stains macrophage and parasite nuclei, and allows rapid identification and quantification of infected cells. In comparison, other stains such as Giemsa bind to a large number of different cellular components with varying intensity, complicating visual analysis37. The use of DAPI allows recognition of intracellular parasites and their clear distinction from cellular structures (only nuclei of host cells are also stained, and their size is several orders of magnitude larger than parasite nuclei), allowing easier and faster quantification of infections. As with any experimental procedure, this method has some limitations and several critical steps that require careful execution. In vivo Leishmania infection involves complex innate immunological response prior to phagocytosis, which determines the ultimate course of infection38. Choice of model mouse strain, therefore, is of critical importance in study design. Both C57BL/6 and BALB/c mice strain used in this protocol bear mutations in the gene encoding the Natural resistance-associated macrophage protein (Nramp1), a proton efflux pump that translocates Fe2+ and Mn2+ ions from macrophage lysosomes/phagolysosomes into the cytosol. This results in increased susceptibility to pathogens that replicate inside the endocytic compartment of macrophages8,30,31. Successful colonization in macrophages also depends on the unique ability of infective Leishmania parasites to manipulate the immune response to suppress/survive macrophage activation39,40. The differentiated macrophages used for Leishmania BMM infections somewhat mimic the non-activated state of macrophages in vivo, but the assay does not account for the much more complex set of host components that influence virulence in animal models. Isolation of healthy infective Leishmania forms is the other absolutely critical requirement for accurate virulence determination. Not all promastigotes of all Leishmania strains efficiently differentiate into amastigotes when subjected to low pH/ high temperature conditions41. Hence, infections are often carried out with metacyclic promastigotes purified from stationary promastigote cultures. To effectively isolate metacyclic promastigotes, some purification strategies take advantage of the changing composition of the parasite surface glycocalyx during different life stages, including extensive modifications of the lipophosphoglycan (LPG) structure42,43,44. For example, peanut agglutinin (PNA), a lectin that binds selectively to procyclic but not metacyclic LPG has been effectively used in negative selection protocols to purify L. major metacyclic promastigotes45. Metacyclic promastigote purification strategy for L. amazonensis usually involves a monoclonal antibody mAb3A.1 which can agglutinate procyclic promastigotes by targeting specific surface protein epitopes that are inaccessible in metacyclic forms due to surface glycocalyx modifications8,13,32. The use of a density gradient media to separate metacyclic promastigotes from promastigotes based on stage-specific differences in buoyant density is an attractive method because it does not depend on species-specific variations in parasite surface ligands. This method, initially described for L. major metacyclic promastigote purification33, has been successfully adopted for several other Leishmania species mainly through modifications of centrifugation conditions during density-gradient sedimentation46,47,48,49. It is also important to be aware of issues that may complicate implementation of the assay, which may occur at several steps in the process. These problems may include contamination during BMM extraction, unsuccessful differentiation of BMMs following extraction, inconsistent macrophage plating, incomplete purification of infective parasite forms, poor or inconsistent infection, and difficulties mounting glass coverslips on microscope slides. These possibilities have been addressed in the protocol, and may be resolved by carefully assessing each step of the infection procedure to identify the problem. For example, contamination of BMM cultures during the differentiation process may indicate a need for improved sterile technique during extraction. Careful attention to the purity and freshness of purification reagents and precise implementation of the purification protocol may rectify unsuccessful or incomplete purification of the desired parasite forms. Poor or inconsistent infections may be caused by inaccurate quantification of parasites or a MOI that is too high or too low for the specific experimental conditions. 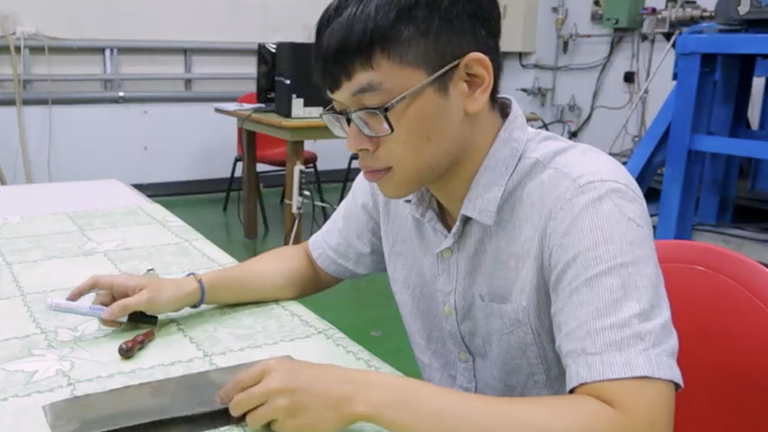 Following extraction, manipulating and mounting the glass coverslips is arguably the most technically challenging process in this technique; individuals may find they prefer to use different tools to facilitate handling of the coverslips. Clear visualization of DAPI stained nuclei is critical for accurate parasite counting under the microscope. Faint staining and improper focusing are two main culprits behind inconsistent quantification. This can be ensured by quality control of the DAPI staining step, limiting light exposure time to reduce photo-bleaching, and quickly changing the objective focus to account for all parasite nuclei in the field. DAPI fluorescence brightness can also be improved by ensuring proper permeabilization of the samples with detergent, and by increasing the concentration of DAPI during staining. An alternative approach that can facilitate the quantification process is to obtain digital images of the samples during microscopic examination. The images can be used for quantification at a later time and can be verified/quantified by independent investigators. However, there are technical difficulties associated with this process that requires careful consideration. Due to the spherical nature of the PV, the parasites are not always on the same focal plane. This necessitates that multiple images be acquired using different focal planes for each microscopic field, and subsequently assembled together to account for all the parasites. Otherwise, quantification from photographs can be very misleading. Calculations of macrophages/field, and amastigotes/field are critical to ensure consistent macrophage plating and spread of parasites was achieved during infection. Since BMMs are fully differentiated cells, their number should not increase over time. If the number of host macrophages increases over time, it means that macrophages were still immature. In that case, the source and concentration of the M-CSF should be checked. Determination of percent infected macrophages can also be useful in providing a comprehensive view of the host cell-pathogen interaction, particularly in cases where percent infection and parasite load do not follow similar trends20,21. The method of in vitro BMM infection detailed here may be modified to suit specific experimental needs. Modifications may be made to any of the basic steps of the process - BMM extraction and differentiation, purification of infective parasite forms, and quantification of in vitro macrophage infections, as well as implementing infections with different MOIs and adjusting the period of infection and time-points analyzed. Culture media components can also be easily modified via either supplementation or depletion of specific nutrients, and multiple different strains or forms of parasites can be assessed simultaneously. These modifications may require additional adjustment of technical procedures; for example, procedures for amastigote preparation and metacyclic promastigote purification are expected to vary between various Leishmania species. Additional fluorescent dyes besides DAPI, or fluorescently tagged cellular components may be utilized to visualize a comprehensive range of host-parasite interaction processes6,24. Moreover, this assay can be adapted to a High Throughput Systems (HTS) format, which would allow for rapid screening of compound libraries to identify new and efficacious drug leads for treating leishmaniasis24. This work was supported by National Institutes of Health grant RO1 AI067979 to NWA. YK is recipient of undergraduate fellowship from the Howard Hughes Medical Institute/University of Maryland College Park. WHO. Control of the leishmaniases. World Health Organ Tech Rep Ser. (949), (2010). Naderer, T., McConville, M. J. Intracellular growth and pathogenesis of Leishmania parasites. Essays Biochem. 51, 81-95 (2011). Rosenzweig, D., et al. Retooling Leishmania metabolism: from sand fly gut to human macrophage. FASEB J. 22, (2), 590-602 (2008). Lahav, T., et al. Multiple levels of gene regulation mediate differentiation of the intracellular pathogen Leishmania. The FASEB Journal. 25, (2), 515-525 (2011). Saunders, E. C., et al. Induction of a stringent metabolic response in intracellular stages of Leishmania mexicana leads to increased dependence on mitochondrial metabolism. PLoS Pathog. 10, (1), e1003888 (2014). Mittra, B., et al. Iron uptake controls the generation of Leishmania infective forms through regulation of ROS levels. J Exp Med. 210, (2), 401-416 (2013). Kloehn, J., et al. Using metabolomics to dissect host-parasite interactions. Curr Opin Microbiol. 32, 59-65 (2016). Huynh, C., Sacks, D. L., Andrews, N. W. A Leishmania amazonensis ZIP family iron transporter is essential for parasite replication within macrophage phagolysosomes. J Exp Med. 203, (10), 2363-2375 (2006). Flannery, A. R., Huynh, C., Mittra, B., Mortara, R. A., Andrews, N. W. LFR1 Ferric Iron Reductase of Leishmania amazonensis Is Essential for the Generation of Infective Parasite Forms. J Biol Chem. 286, (26), 23266-23279 (2011). Miguel, D. C., Flannery, A. R., Mittra, B., Andrews, N. W. Heme uptake mediated by LHR1 is essential for Leishmania amazonensis virulence. Infect Immun. 81, (10), 3620-3626 (2013). Cortez, M., et al. Leishmania Promotes Its Own Virulence by Inducing Expression of the Host Immune Inhibitory Ligand CD200. Cell Host Microbe. 9, (6), 463-471 (2011). Mittra, B., Andrews, N. W. IRONy OF FATE: role of iron-mediated ROS in Leishmania differentiation. Trends Parasitol. 29, (10), 489-496 (2013). Mittra, B., et al. A Trypanosomatid Iron Transporter that Regulates Mitochondrial Function Is Required for Leishmania amazonensis Virulence. PLoS Pathog. 12, (1), e1005340 (2016). Ben-Othman, R., et al. Leishmania-mediated inhibition of iron export promotes parasite replication in macrophages. PLoS Pathog. 10, (1), e1003901 (2014). Renberg, R. L., et al. The Heme Transport Capacity of LHR1 Determines the Extent of Virulence in Leishmania amazonensis. PLoS Negl Trop Dis. 9, (5), e0003804 (2015). McConville, M. J. Metabolic Crosstalk between Leishmania and the Macrophage Host. Trends Parasitol. 32, (9), 666-668 (2016). Carrera, L., et al. Leishmania promastigotes selectively inhibit interleukin 12 induction in bone marrow-derived macrophages from susceptible and resistant mice. J Exp Med. 183, (2), 515-526 (1996). Hsiao, C. H., et al. The effects of macrophage source on the mechanism of phagocytosis and intracellular survival of Leishmania. Microbes Infect. 13, (12-13), 1033-1044 (2011). Murray, A. S., Lynn, M. A., McMaster, W. R. The Leishmania mexicana A600 genes are functionally required for amastigote replication. Mol Biochem Parasitol. 172, (2), 80-89 (2010). Farias Luz, N., et al. RIPK1 and PGAM5 Control Leishmania Replication through Distinct Mechanisms. J Immunol. 196, (12), 5056-5063 (2016). Franco, L. H., et al. Autophagy downstream of endosomal Toll-like receptor signaling in macrophages is a key mechanism for resistance to Leishmania major infection. J Biol Chem. 292, (32), 13087-13096 (2017). da Silva, M. F., Zampieri, R. A., Muxel, S. M., Beverley, S. M., Floeter-Winter, L. M. Leishmania amazonensis arginase compartmentalization in the glycosome is important for parasite infectivity. PLoS One. 7, (3), e34022 (2012). Carneiro, P. P., et al. The Role of Nitric Oxide and Reactive Oxygen Species in the Killing of Leishmania braziliensis by Monocytes from Patients with Cutaneous Leishmaniasis. PLoS One. 11, (2), e0148084 (2016). Siqueira-Neto, J. L., et al. An image-based high-content screening assay for compounds targeting intracellular Leishmania donovani amastigotes in human macrophages. PLoS Negl Trop Dis. 6, (6), e1671 (2012). Pastor, J., et al. Combinations of ascaridole, carvacrol, and caryophyllene oxide against Leishmania. Acta Trop. 145, 31-38 (2015). Giarola, N. L., et al. Leishmania amazonensis: Increase in ecto-ATPase activity and parasite burden of vinblastine-resistant protozoa. Exp Parasitol. 146, 25-33 (2014). Sacks, D. L., Melby, P. C. Animal models for the analysis of immune responses to leishmaniasis. Curr Protoc Immunol. Chapter 19 Unit 19 12 (2001). Tabbara, K. S., et al. Conditions influencing the efficacy of vaccination with live organisms against Leishmania major infection. Infect Immun. 73, (8), 4714-4722 (2005). Price, J. V., Vance, R. E. The macrophage paradox. Immunity. 41, (5), 685-693 (2014). Huynh, C., Andrews, N. W. Iron acquisition within host cells and the pathogenicity of Leishmania. Cell Microbiol. 10, (2), 293-300 (2008). Blackwell, J. M., et al. SLC11A1 (formerly NRAMP1) and disease resistance. Cell Microbiol. 3, (12), 773-784 (2001). Pinto-da-Silva, L. H., et al. The 3A1-La monoclonal antibody reveals key features of Leishmania (L) amazonensis metacyclic promastigotes and inhibits procyclics attachment to the sand fly midgut. Int J Parasitol. 35, (7), 757-764 (2005). Spath, G. F., Beverley, S. M. A lipophosphoglycan-independent method for isolation of infective Leishmania metacyclic promastigotes by density gradient centrifugation. Exp Parasitol. 99, (2), 97-103 (2001). Zilberstein, D., Shapira, M. The role of pH and temperature in the development of Leishmania parasites. Annu Rev Microbiol. 48, 449-470 (1994). Bates, P. A. Transmission of Leishmania metacyclic promastigotes by phlebotomine sand flies. Int J Parasitol. 37, (10), 1097-1106 (2007). Bates, P. A., Robertson, C. D., Tetley, L., Coombs, G. H. Axenic cultivation and characterization of Leishmania mexicana amastigote-like forms. Parasitology. 105, (Pt 2), 193-202 (1992). Frickmann, H., et al. Rapid identification of Leishmania spp. in formalin-fixed, paraffin-embedded tissue samples by fluorescence in situ hybridization. Trop Med Int Health. 17, (9), 1117-1126 (2012). Seguin, O., Descoteaux, A. Leishmania, the phagosome, and host responses: The journey of a parasite. Cell Immunol. 309, 1-6 (2016). Wanderley, J. L., Thorpe, P. E., Barcinski, M. A., Soong, L. Phosphatidylserine exposure on the surface of Leishmania amazonensis amastigotes modulates in vivo infection and dendritic cell function. Parasite Immunol. 35, (3-4), 109-119 (2013). Crauwels, P., et al. Apoptotic-like Leishmania exploit the host's autophagy machinery to reduce T-cell-mediated parasite elimination. Autophagy. 11, (2), 285-297 (2015). Bringmann, G., et al. A novel Leishmania major amastigote assay in 96-well format for rapid drug screening and its use for discovery and evaluation of a new class of leishmanicidal quinolinium salts. Antimicrob Agents Chemother. 57, (7), 3003-3011 (2013). Sacks, D. L., Brodin, T. N., Turco, S. J. Developmental modification of the lipophosphoglycan from Leishmania major promastigotes during metacyclogenesis. Mol Biochem Parasitol. 42, (2), 225-233 (1990). Sacks, D. L. Leishmania-sand fly interactions controlling species-specific vector competence. Cell Microbiol. 3, (4), 189-196 (2001). McConville, M. J., Turco, S. J., Ferguson, M. A., Sacks, D. L. Developmental modification of lipophosphoglycan during the differentiation of Leishmania major promastigotes to an infectious stage. EMBO J. 11, (10), 3593-3600 (1992). Sacks, D. L., Hieny, S., Sher, A. Identification of cell surface carbohydrate and antigenic changes between noninfective and infective developmental stages of Leishmania major promastigotes. J Immunol. 135, (1), 564-569 (1985). Yao, C., Chen, Y., Sudan, B., Donelson, J. E., Wilson, M. E. Leishmania chagasi: homogenous metacyclic promastigotes isolated by buoyant density are highly virulent in a mouse model. Exp Parasitol. 118, (1), 129-133 (2008). Almeida Marques-da-Silva, E., et al. Extracellular nucleotide metabolism in Leishmania: influence of adenosine in the establishment of infection. Microbes Infect. 10, (8), 850-857 (2008). Moreira, D., et al. Impact of continuous axenic cultivation in Leishmania infantum virulence. PLoS Negl Trop Dis. 6, (1), e1469 (2012). Svensjo, E., et al. Interplay between parasite cysteine proteases and the host kinin system modulates microvascular leakage and macrophage infection by promastigotes of the Leishmania donovani complex. Microbes Infect. 8, (1), 206-220 (2006).